Here are my thoughts on what is known as negative visualisation, I will later cover other topics on Stoicism, but I think each deserves it's own attention. An ancient Greek school of philosophy founded at Athens by Zeno of Citium. The school taught that virtue, the highest good, is based on knowledge; the wise live in harmony with the divine Reason (also identified with Fate and Providence) that governs nature, and are indifferent to the vicissitudes of fortune and to pleasure and pain. Tranquillity to a Stoic is a state of mind where your consciousness becomes impenetrable to negative emotion. Jealousy, anger, anxiety become easy to repel. Joy, freedom, no inhibitions, these are the traits characterised by the mind when a Stoic is able to accept negative thoughts for what they are, rather than for what they mean. How did the Stoics achieve tranquillity? What were the methods and mindsets they cultivated to actualise the ability to accept negative emotion and not get tangled in its web of deception? Negative visualisation is the meditative practice of intentionally bringing the worst, negative contemplations into your mind. The Stoic’s would focus and meditate on the loss of loved ones, assets and basically they manifested the antonyms of what makes them happy. This sounds counterproductive, but what this ‘negative visualisation’ achieved was a larger gratitude and appreciation for what one already has. Stoicism suggests to us that people in general continually seek happiness and good emotion from what they don’t already have. We are always chasing what we don’t have to make us happy and of course, that’s not how life works. The Stoics understood this and created a ‘hedonic adaptation’ to counter this flawed societal consensus. The use of negative visualisation was in many ways ‘the cure’ to peoples’ paradigm for what happiness really is. You may consider there being more power in focusing on nothing but the positive and maybe this works for you, great! However, try to understand that nature works in the inverse. Having a life philosophy is something everyone needs. It’s important to adopt one that fits your deepest, instinctual beliefs of what works and what is true. Treat it like a personal code that must never be broken. If you haven’t found your life philosophy, you must find one as soon as possible. It wasn’t until I adopted the doctrine of Stoic philosophy that the changes I wanted for myself actually become reality. People just get used to what they already have and these ‘things’ only produce value in hindsight. These ‘things’ I speak of aren’t only inclusive to our physical possessions. Most self-help information out there has given us a clear manifesto on why cultivating a positive reality for ourselves comes down to focusing on the good. Such one-sided belief must be questioned. We strive to accomplish what we want. When we achieve our desires we lose satisfaction. This fuels our demand for ‘more’. Don’t get discouraged about having some sort of desire, this is healthy and will motivate you to take action and improve. However, focusing on the contrary and constantly looking at what you don’t have is wrong. By doing so you are subconsciously creating synapses in your brain that no matter how fit you get, no matter how much muscles you gain, or how much money you make, there’s no contentment. You will lack the ability to be satisfied with the present, which is where life is lived. 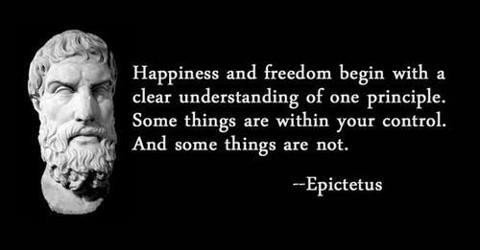 No matter what your situation the stoics teach us to be content right now by looking at what you have rather than what you don’t. As previously mentioned, most self-help literature rejects the notion of negative visualisation and claims that positivity is the only way. It appears their idea of ‘negative visualisation’ constitutes worry, anxiety and contemplation about these visualisations actually happening. There’s a clear distinction between the negative (health of our body, job losses) and actively focusing on the anxiety this would bring. It is a cognitive exercise, a psychological and intellectual weapon for you to use to appreciate your current situation. As a consequence this fuels our demand for ‘more’. We should not become frustrated with ourselves if we don’t succeed at first. Furthermore, we can learn from our early failures to improve our chances of success next time. Use negative visualisation as a tool to face life’s difficulties. Use it to grow your capacity as a human being and recognise that our demand for more is fleeting. Centre your attention and appreciation on what you currently have, not what you lack. Everything that you have right now could be lost instantly. Use this notion to fuel your desire to live. The idea that you must always focus on the positive thoughts to become more positive is idle. I will leave you with a wise message from Marcus Aurelius. Life is more like wrestling than dancing. Ultimately we either make a decision to avoid the bad and only focus on the good or we face what appears bad to build integrity. The real winner remains the most engaged and yet the least attached.